The SAS-format drive controller in an EMS provides access to four SAS-format hard drives. Each SAS-format hard drive has two ports, allowing for redundant access by two EMSs. Note - A SATA-format SSD has a single port, and does not have redundant access. 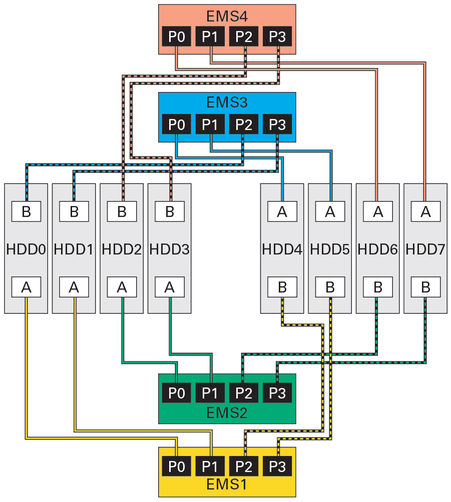 For SATA-format SSD information, see Nonredundant EMS Control of SATA-Format Drives. For redundancy, each SAS-format drive can be accessed by two EMSs. For additional redundancy, each EMS is located in different halves of the same IOU so that disk access is maintained even if one of the two IOBs (I/O switch boards) fails in an IOU. For details on EMS paths and redundancy, see Server Administration, EMS SAS-format paths to internal drives. EMSs provide redundant access to SAS-format hard drives that have dual ports.